B2B Payment Processing: How Do Electronic Payments Work? Finding ways to drive sales on your website. Removing obstacles getting in the way of sales. Streamlining the business processes through which your company interacts with customers. Nothing about payment processing… or is there? For B2B companies, payment processing plays a key role in all of the above challenges. Your payment gateway could be stalling online sales if it doesn’t have advanced functionality. It may not have a good system in place to ensure most payments get authorized, or have the capability to fully support subscriptions. Your payment gateway could be adding to the obstacles standing in the way of sales, or doing little to address them. It could be that your menu of payment options is limiting sales, or, if you don’t have a website, that your gateway can’t support phone orders or invoice payments. Your payment processor may not be giving you the right tools to create a seamless customer experience. Can buyers pay in multiple ways? Does your payment processing platform allow you to handle orders within the business software you’re already using? Details like these make the payment process almost invisible, so your customers won’t think twice about buying. Your payment gateway (or gateways!) could be complicating B2B payments for both you and your customers. You shouldn’t need more than one payment gateway to get everything you need for successful processing. It should also make things like reporting and reconciliation a snap. Has B2B payment processing moved to the top of your list yet? Hopefully, the answer is yes. So far, your experience with the B2B payments process might be in line with that of most other merchants: It’s complex. It takes too long. It has too many friction points. It helps minimize the impact of unsuccessful payments. It reduces the amount of work involved for your finance or accounting team. It’s convenient for your customers. 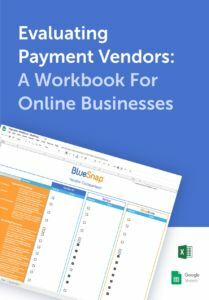 Interested in knowing more about how BlueSnap’s electronic B2B payment processing can help your business? Ask us anything. So if you’re looking for something that could help drive sales, improve the customer experience, and streamline your business processes, consider implementing electronic B2B payment processing. How does electronic B2B payment processing work? To answer that, let’s break it down into smaller questions. 1. How will my customers submit a payment online? ChargeLink —Let shoppers take control of the ordering process themselves using ChargeLink, which lets you email them a payment link or embed the link in an invoice. Using any web-enabled device, the customer clicks on the link and fills in payment information on their own, then submits it to complete the payment process. 2. What happens after they submit payment information? The gateway captures the transaction request, encrypts the payment information, and routes it to an acquiring bank. The acquiring bank (the organization that provides your merchant account) takes ownership of the transaction request. Its job is to get authorization for the transaction. The issuing bank assesses the request: Does the customer have sufficient credit or funds? The issuing bank generates a response—yes or no—and sends it back to the acquiring bank via the card network . The payment gateway’s final job is to present the answer either back to the merchant or to the shopper directly (if your using a hosted payment page): Congratulations, your order was approved! 3. What types of payment methods can be accepted? Typically, most common credit/debit cards and ACH payments can be accepted for online B2B payments. 4. Will the payment gateway integrate with the other business software we use? That depends on the payment processor you choose. BlueSnap integrates with hundreds of partners, including numerous shopping carts (like Magento, WooCommerce, BigCommerce, WordPress, and many more) and business software solutions (like Salesforce, LimeLight, Netsuite, and more). B2B payment integration with your existing software should be an important qualification for whatever payment gateway you choose. It gives you more ways to accept payments from customers and increases efficiency. 5. How secure is electronic B2B payment processing? Because your payment gateway will be handling credit/debit card transactions, make sure it’s compliant with the Payment Card Industry Data Security Standard (PCI-DSS). PCI compliance can be costly and burdensome—unless your payment processor handles much of the burden for you. Find out what type of PCI compliance level they would provide, and if that still allows you to accomplish all the functionality your business needs. If you’re a merchant using BlueSnap’s Virtual Terminal and/or ChargeLink solutions, you can rest assured that your payment solution is PCI compliant. 6. How do recurring online payments work? Recurring payments or subscription-based sales should be as simple as regular sales orders. Make sure your payment processor has the capability to automatically initiate subscription payments monthly, quarterly, or annually—or at whatever interval you like. Our Virtual Terminal can be used to initiate a subscription or recurring payment plan so your customers pay the same amount on a monthly basis. And if you send an electronic invoice with a link to pay online, that hosted page can be used to initiate a recurring payment as well. There’s never any need for customers to submit payment information more than once. Ready to get started with online B2B payment processing? It’s easy. Just click here to talk to a BlueSnap conversion consultant who can answer any questions you have, or, if you’re ready to get going, help get your business connected. As your B2B payment gateway, we’re committed to giving you everything you need to create an exceptional buying experience for your customers—and to making your life easier, too!